IT Best Practices: Intel’s silicon design engineers need significant increases in computing capacity—both on their workstations and on data center servers—to deliver each new generation of silicon chips. To meet those requirements, Intel IT conducts ongoing throughput performance tests, using the Intel silicon design workloads, to analyze the benefits of introducing compute servers based on new, more powerful processors in the field of electronic design automation (EDA). 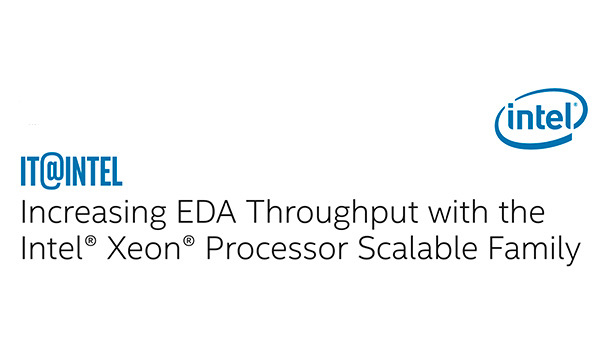 We recently tested a dual-socket server based on the latest Intel Xeon Platinum 8168 processor running single-threaded and multi-threaded EDA applications operating on more than 200 hours of Intel design workloads. By utilizing all available cores, the server completed the workloads up to 86x faster than a server based on a 64-bit Intel Xeon processor (3.6 GHz) with a single core. The Intel Xeon Platinum 8168 processor-based server was up to 24x faster than a server based on the Intel Xeon processor 5160 (3.0 GHz) with two cores. Based on our performance assessment and our refresh cycle, we plan to deploy servers based on the new Intel Xeon Platinum 8100 processor series, completing our replacement of servers based on the 8-core Intel Xeon processor E5-2600 series that are more than four years old. By doing so we expect to significantly increase EDA throughput while realizing savings, because we can avoid data center construction and reduce additional power consumption.